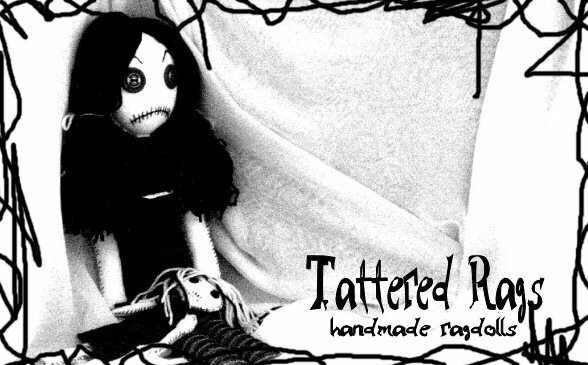 Welcome to Tattered Rags dot Net, home of Jodi Cain's handmade ragdolls. My dolls and their clothes are always hand stitched without patterns, making each one unique and one of a kind. When making my dolls, I always use vintage buttons and occasionally vintage fabrics. Most of my dolls are around 22 inches tall, made of soft flannel fabric, and stuffed with fiber fill and wire. I also design and create all clothes, jewelry, and accessories by hand. Check out my Gallery to see samples of my dolls. There you'll find a wide variety, ranging anywhere from Horror related, Gothic, Holiday inspired, and just plain Creepy. I'm always making new dolls, so I update my gallery weekly! Check out my current auctions on Ebay where new dolls are listed and auctioned each Sunday evening. They can also be purchased, shipped Priority and Airmail Worldwide, here on my website by clicking Shop, where you can pay securely Via Paypal. *NOTE* Please E-mail me for shipping rates before purchasing from my shop if you are outside of the USA, or would like to buy multiple dolls. I also take custom orders to recreate any of the dolls in my gallery, or I can turn your ideas into a rag doll as well. E-mail me for details. You can learn about how to purchase custom made dolls by visiting my Custom page.